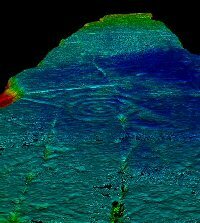 This project tests the novel technique of 3D laser scanning for the recording of prehistoric rock carvings. The main objectives is to assess the reliability, accuracy and precision of this technique for recording purposes and to evaluate its capacity to discover new carved motifs invisible to the naked eye. In addition the project assessed the potential of the technology for monitoring rock surface decay, and examined its value as a visualisation and presentation tool. The study was undertaken at two stone circles in Cumbria which exhibit megalithic art: Castlerigg and Long Meg and Her Daughters (pictured right), on the Copt Howe panel also in Cumbria, and the Horseshoe Rock in Northumberland.